Love and Life at Leadora: I'm Back! Hello! I'm baaaack....and, as you can see, my travel journal is stuffed to the brim! Here, I'll open it up, so you can see it all! 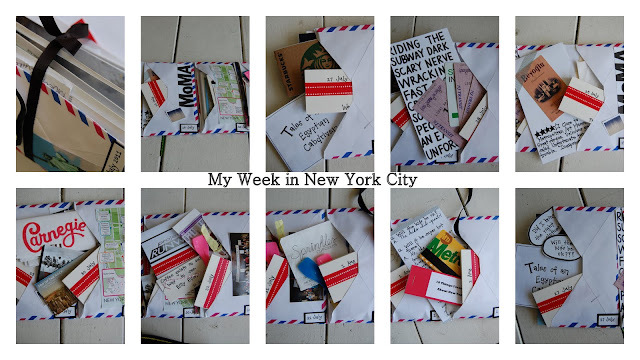 I wanted my journal to be interactive, so besides writing our itinerary for the day, I also included stories about the people we met, my own restaurant reviews, ticket stubs, quotes, receipts, photographs, and even my own version of subway art. Finally figuring out the subway system on our last day! ﻿It's good to be home, but now it's time to get ready to go back to school. My poor kids will start August 23! Why does summer always have to go by so fast? I am thrilled taht you had such a wonderful time. And, the next time I go on a trip I am definately going to use your envelope idea...I just love it both cleaver, and practical. I just love that journal idea. Now I just need somewhere to go, hah. School starts here on the 22nd as well. I hope it cools down. great project... Did the envelopes hold up ok? will you be sharing more details & photos of your trip? the top right picture looks like you were "rating" the restaurant, museum, play or ? with a 5 star system... I may have to duplicate that idea. Welcome Back! even though it's warm at home & your kids are getting ready for school, I'll bet you're thrilled to be climbing into your own bed. There's something about a familiar bed, huh!! I hope you share more pics of your NYC trip. I'm totally in love with your envelope journal. I should have gotten my act together and done this for the girls before headed out. I'm in denial about fall and school start-up. I can't wait to see more photos. Your book looks awesome!!!! I'm glad you had a nice trip! I've always wanted to go to New York. 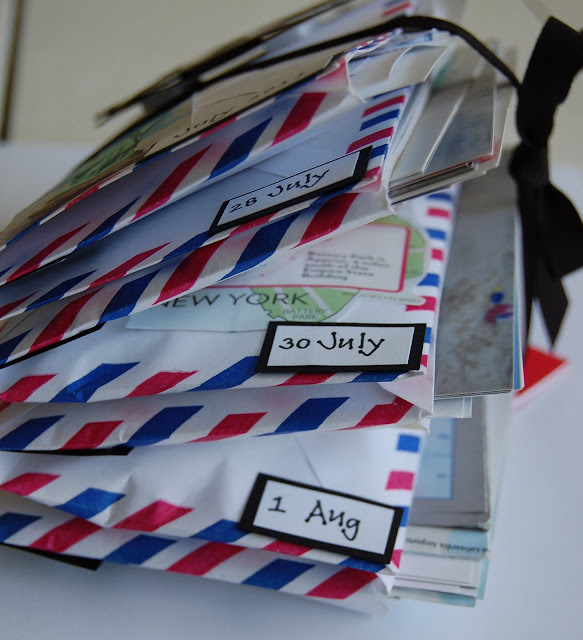 Love your travel journal, that was a really neat idea. It's already organized when you get it home. Welcome back...love the idea on the travel book. I'll be waiting and hoping we get to hear more about the trip and pictures. Enjoy what's left of summer time with your family - time really does fly when you're having fun!! Also, the bathroom looks great! Can't wait to see the finished console. Welcome back Heather....Looks like you guys did a lot and had a wonderful time in New York. What a great idea for a travel journal. You still have a few more days of summer left...Enjoy them to the max. Welcome back. I hope you tried New York style pizza. Glad you had a good time and accomplished what you had planned!